Eight years ago the much-talked about Atlantis, The Palm resort hotel opened on the edge of an artificial island off the Arabian Gulf. Just minutes away from the bustling city of Dubai, it was, and still is, one of the true feats of architectural imagination, creating a drawing point to the city that has made tourism one of its primary sources of income. Eight years on and the resort is still one of Dubai’s most popular accommodation options – despite huge competition from other hotels and resorts, such as the dhow-shaped Burj al Arab, which is also known as the most luxurious hotel in the world, and other 5-star resorts such as the One&Only, the Royal Mirage Arabian Court, Oberoi Dubai, Al Qasr at Madinat Jumeirah and the Ritz Carlton. And there’s good reason for this. Atlantis, The Palm has put enormous effort into making a stay with them a fun, relaxing, even educational experience for the whole family. 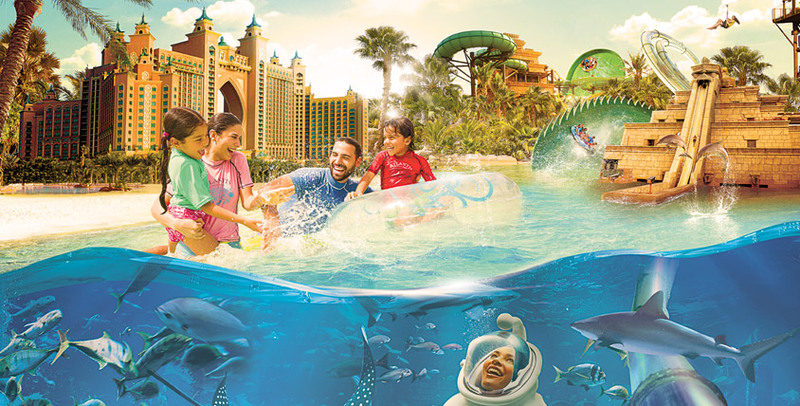 Aquaventure Water Park has some of the most thrilling rides and slides in the city where there are water parks galore. The river that runs through it is 1.7 km long, allowing guests to choose between wild rapids and calm waters on their 45min ride. The fine dining restaurant Ossiano looks into the Ambassador lagoon, filled with thousands of sea creatures. You can propose to your loved one here by getting a diver to swim up to the window at your table with a sign saying: “”Will You Marry Me”. The hotel has two underwater suites: Poseidon and Neptune. With floor-to-ceiling windows looking into the Ambassador Lagoon, guests see the dramatic ancient ruins of the mythical lost city and its 65,000 marine inhabitants. Dolphin Bay at Atlantis is the largest coastal dolphin habitat in the world. This 4.5 hectare environment has seven interconnected pools and three interaction lagoons. Here guests can interact with the dolphins and go for a dorsal tow. The hotel has 23 restaurants and bars, including restaurants created by world-renown chefs Gordon Ramsay and Nobu Matsuhisa. Friday brunch is a big deal in Dubai, and Atlantis is consistently rated as one of the best places to go for brunch in the city. Atlantis, The Palm’s Nasimi beach parties are legendary, and live performances are held throughout the year (book now for New Year!). The resort’s ShuiQi Spa has been nominated as one of the best spas in the world at the 2016 World Luxury Spa Awards. The Lost Chambers Aquarium, built within the resort, is home to thousands of marine animals and plants and offers shark night dives and underwater treks with the aid of special breathing helmets. Fun fact; The Lost Chambers Aquarium is also available as a wedding venue at Atlantis, The Palm. The resort has its own ‘shopping mall’, representing famous fashion and jewellery houses of the world alongside souvenir shops, boutiques and confectionary shops. The massive scale of the resort, it’s isolation on the Palm Islands, the ongoing special activities, the luxurious rooms and extras such as yacht cruises, private butlers, helicopter tours and private beach cabanas make this our top pick for holiday accommodation in Dubai.